In a bowl, combine the orange segments and juice, fennel, olives, lemon juice, and olive oil; season with salt and pepper, and toss gently. Set aside. In a large nonstick skillet, heat the coconut oil over medium heat. Add salmon fillets, flat side down, and cook until browned, about 3 minutes. Turn salmon and cook until opaque throughout, 1 to 3 minutes more, depending on thickness. 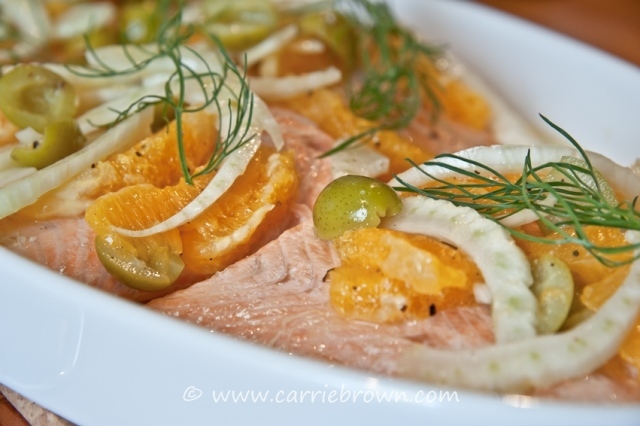 Place salmon fillets in a serving dish and spoon the orange mixture over the top of each piece. Notes: Segmenting an orange: with the peel still on the fruit, slice off the stem and blossom ends. Following the fruit’s curve, cut away the peel and white pith. Then, over a bowl, cut along the membranes to release the segments. Once the segments of orange are removed, squeeze the membranes for juice. **You cannot taste the coconut in the finished dish. Trust me on this one if you’ve never used coconut oil for cooking before.